We sold our electric train set last weekend! Dad had put an advert in the Garston & Woolton Weekly News “For Sale” column, it came out last Friday and some man came round on Sunday morning and bought it for his kids. I shall miss it a bit but Bernie and I haven’t played with it in ages and it was in the loft. I’ve still got a photo to remind me of what it looked like when it was all set up. So we now have a whole eight pounds to buy a guitar. However as I got the banjo Dad says that the guitar will have to belong to Bernie, so I suppose that’s fair. At least I can learn to play it and use it even though it doesn’t actually belong to me. Today I got the bus into town and had a look round the guitar shops. I started off at Frank Hessy’s and then went to Rushworth’s. Unfortunately eight quid isn’t going to get us much of a guitar, there is such a lot of expensive rubbish around. I even walked all the way up London Road to Samuel’s, opposite T.J.Hughes, which is where Eric bought his “Cat’s eyes” Egmond from, and again there wasn’t much for eight pounds. 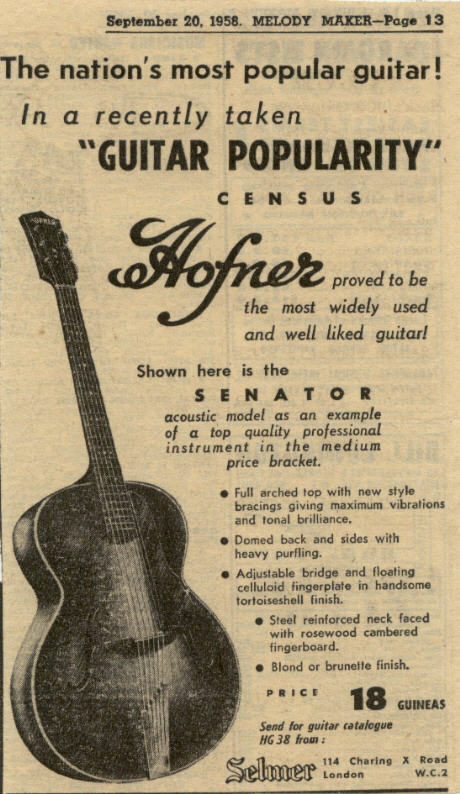 I think we’ll have to start looking for a second-hand guitar in the small ads in the Echo, they have a column which has just musical instruments for sale, so we might pick up something there.